Baby changing station liners by Rubbermaid. This vertical baby changing unit is manufactured with an antimicrobial agent that helps to inhibit the growth of odour and stain causing bacteria. It also helps to reduce the risk of cross-contamination. An ergonomic modern design provides convenient, one-handed opening, essential when handling baby at the same time. Two built-in hooks provide ready access to nappy bag or purse, whilst an accessory shelf holds baby changing supplies close at hand. 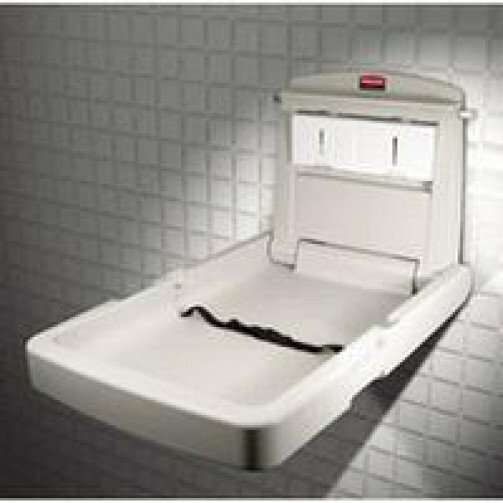 The unit features a smooth, crevice free design with adjustable safety belt and built-in liner dispenser. The Vertical Baby Changing Station is supplied with mounting kit. Meets all applicable ASTM, ADA, FDA and EN global safety regulations and standards.